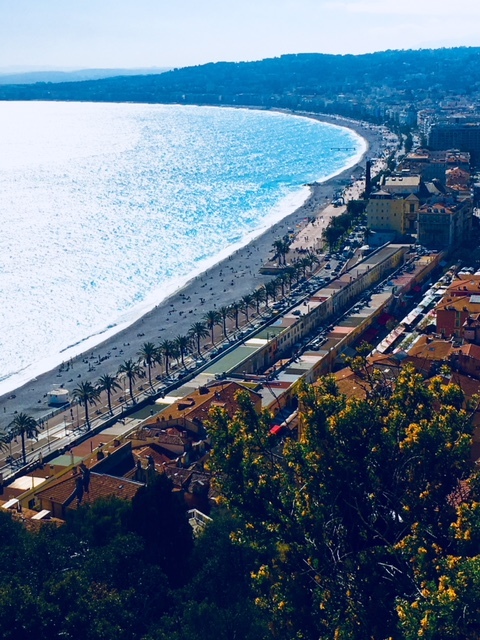 I started the journey with a small group in Nice, France where we spent three nights and explored some small, medieval towns and of course the tiny country of Monaco. The blend of French & Italian cuisine in this area is beyond enjoyable. We had seafood, gnocchi and vegetables so fresh they could have been picked that morning. We visited the flower markets, the food markets and hiked to the top of the “palace ruins” for a view over the city. Then we hopped on a bus to Arles, that took us to our home for 7 nights, the Avalon Poetry II, which sailed up the Rhone & Saone rivers. Each town has its own history and unique offerings. We visited Arles, Avignon, Viviers, Tournon, Vienne & Lyon with some side trips in between. We met each evening at the dinner table on the ship, where we were served gourmet food and wine and exchanged experiences of the day. On our final day, we were transported by bus from the ship to Lyon, through the Beaujolais region. Although the weather wasn’t the best, it could not dampen the region’s beauty, surpassed only by the hospitality of the vineyard owners that we visited. We stopped at a small, family owned vineyard, Domaine de Fond-Vieille, worked by a fourth generation son, Dominique. We tasted not only their amazing Beaujolais wines, but their home cooking as well. Lunch was prepared by Dominique’s wife and paired with three different Beaujolais wines and was traditional, hearty and delicious! It was a pleasure to support a small family vineyard. Then on to Lyon and its old town and the most unique hotel I’ve ever had the fortune to stay in. 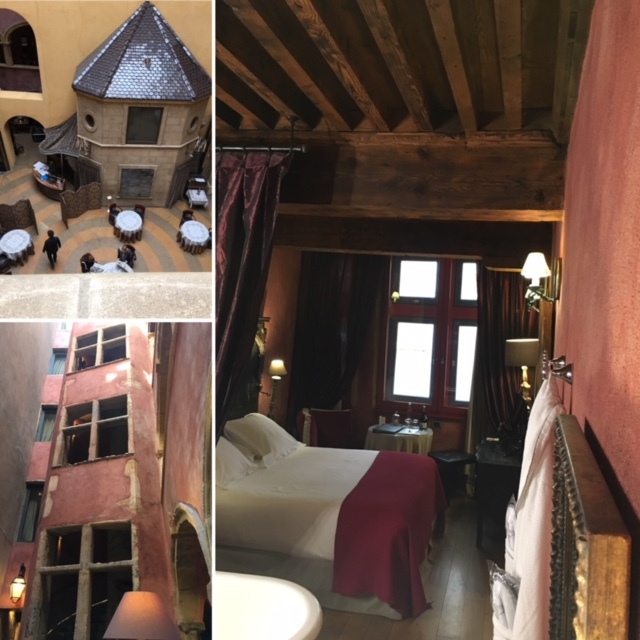 Cour des Loges was created from four separate merchant houses, one dating back to the 14th century. Being a city of trade in that time, the Italian merchants especially had influence on the architecture and art and although these buildings went through many uses, they were luckily restored and renovated into this beautiful 5 star hotel in the late 1970’s. Each room is unique, with exposed old timbers, stone staircases, a covered courtyard that houses the reception area and a Michelin starred restaurant. What makes our group trips different than any others are the experiences we provide and the hotels we choose to stay in. When I fall in love with a village or a city, a hotel or a restaurant in Europe, I want to share it with others. Everything we experienced on this particular trip was because I had been lucky enough to have been to these places before and just wanted to share the joy!